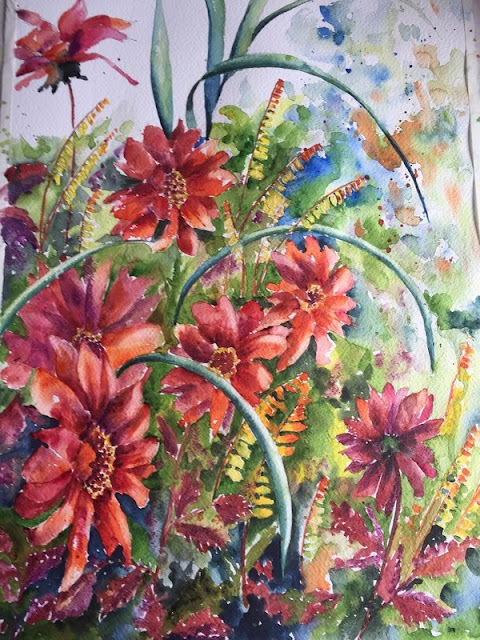 These days I spend more time painting than planting so I'm going to tell you today about a recent challenge. 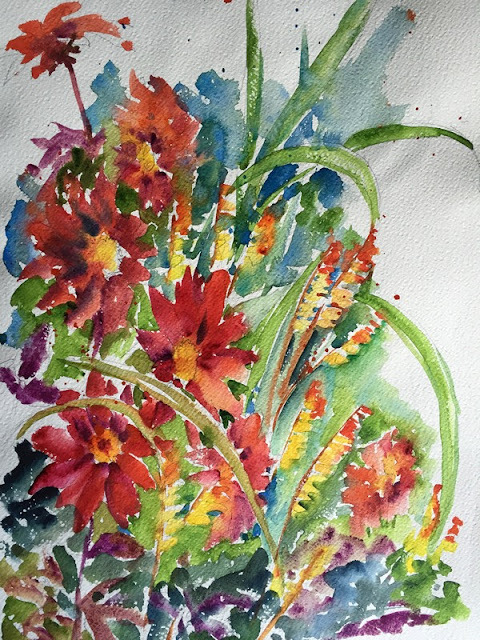 It goes back to when I started my watercolor painting some years ago. Since then I have traced a path between elation on the successful days and misery at times when it hasn't worked! I guess I started out ambitious and one of my first attempts was to capture the colorful profusion of the exotic garden at Great Dixter and this is the photograph that inspired me. 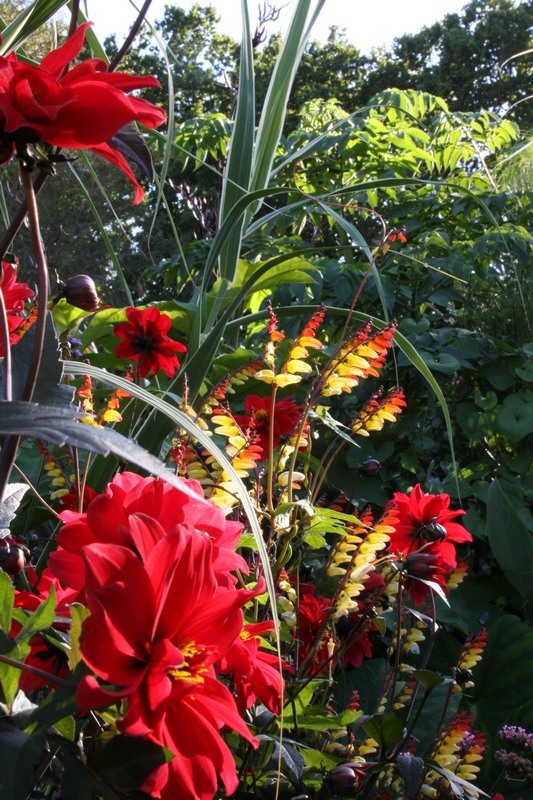 Wonderful red 'Bishop of Llandaff' dahlias, glowing necklaces of Ipomoea lobata, sometimes called Spanish flag and spidery threads of Miscanthus, the low autumn sun glinting through the foliage. But I soon came down to earth, when my brush refused to produce the magical images I envisaged. Below is my first rather pathetic attempt at synthesizing the essence of the picture in watercolor, which I amazingly kept. Recently, the Coachella Valley Watercolor Society announced its annual summer challenge. 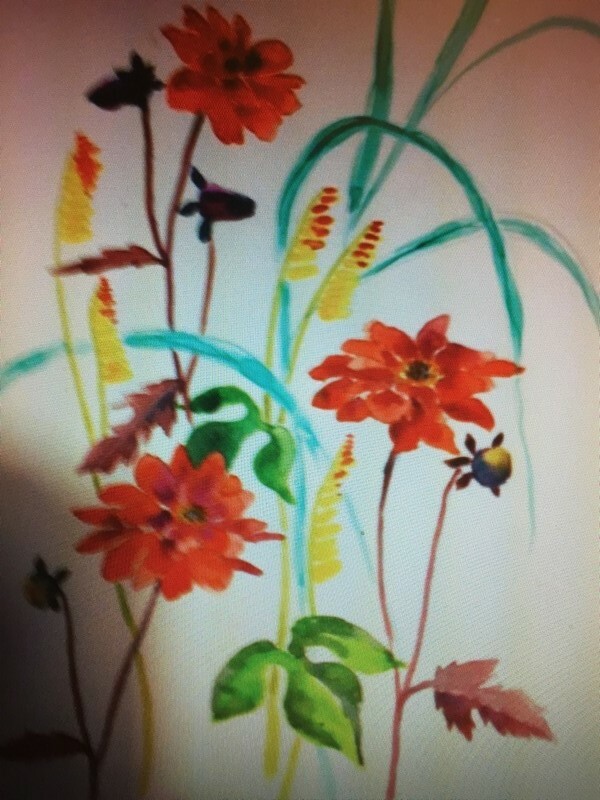 This was to find a picture that any of us had painted way back in our watercolor careers and recreate with our current skills. For some this may mean thirty or more years painting but in my case it was just four. This was my first attempt, painted in 2011. Sorry - poor photo! Since then I have painted regularly, attended classes, been on a few workshops and despite the many torn up failures have found much reward in painting. I guess I've improved as I now sell through the Desert Art Center and have won a few awards. So up to the present and my two recent attempts at recreating the same scene with my current skills. I might have been tempted to leave it at painting number three but when I removed the masking tape I ripped off the corner of the painting, so I have to do it once more - can I improve it again before October?